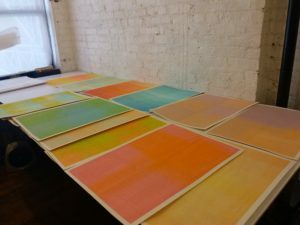 New works on paper at Aminlari’s Greenpoint, Brooklyn studio. Earlier this month we had the opportunity to visit artist Abdolreza Aminlari in his Greenpoint, Brooklyn studio. Born in Tehran in 1979, Aminlari attended the New York Studio Program and attained a BFA from the College of Creative Studies in Detroit, Michigan. Represented by Andrew Rafacz Gallery in Chicago, Aminlari’s work has been featured in numerous group shows as well as solo and two-person exhibitions at galleries such as Cuadro in Dubai (2017) and New York galleries Taymour Grahne (2016) and Longhouse Projects (2014). His next solo exhibition will take place at Andrew Rafacz Gallery in 2018. JL: When did you realize that you wanted to dedicate your life to making art? Can you tell us a bit about your education in the arts? AA: I was really young, around 4 or 5 years old in Tehran when I announced to my parents that I wanted to be an artist. From then, I evolved and revolved around art until I finally went to art school. It took some convincing of my parents to allow me to go. With Iranian parents, it is almost expected that you become a doctor. In Detroit, at CCS (College for Creative Studies), my concentration was Photography, and my education was very much entrenched in Photography and its particular history. In 2001, I had the privilege of participating in the New York Studio Program, which was the first time I experienced cross-disciplinary discourse. It really has had a lasting impact on how I think about and approach my work. Linea installation view at Taymour Grahne Gallery, New York (2016). JL: Your formal training is in photography and certainly, photography remains one of the pillars of your practice. Additionally, you have been making these beautiful works with thread for quite some time. Can you tell me why and when you started working with thread? AA: When I moved to NY in 2002, before digital photography became a real viable option, the cost of film, processing, paper, darkroom rentals etc., was a real hindrance in working with photography. I began drawing out of a need to work on my ideas and to see them to fruition. Around 2008, I was working on a series of drawings, based on identification card pictures of Iranian women (mostly family members). My focus was on the hijab in the photographs. I was calling these drawings ‘fabric studies’, but graphite on paper didn’t quite seem to convey the sense of intimacy they needed. It just seemed logical for me to turn to thread and embroidery on paper. The use of thread still referenced drawing for me, but it elevated the works. As I started using thread more, the material began to take a greater role in both my practice and concepts. 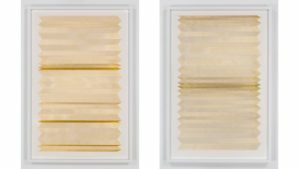 Left: Abdolreza Aminlari, “Untitled” (2015), 18 K gold thread on paper, 40 1/4 x 26 inches. 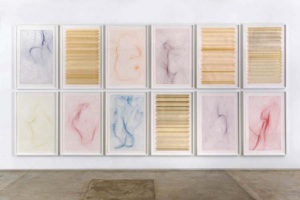 Right: Abdolreza Aminlari, “Untitled” (2014), 18 K gold thread on paper, 40 1/4 x 26 inches. JL: For a long time, you worked predominantly with black and gold thread. More recently, you have introduced vibrant colors into your work. What inspired this shift? AA: Gold is dependent on light, and it reflects light, in a way it embodies all colors. So I feel it was inevitable for me to start using color. JL: When I look closely at your new colored thread works, it becomes clear that you are able to achieve incredible depth and texture by layering the thread. For this body of work do you work according to an exact plan or is the process more organic? AA: For this new series of work, like some of my other works, I do have a set of rules and guidelines. I create a digital blueprint as a starting point, but at the same time, they are very organic. The colors and layering happen in the moment. In a way, this work is my approach to painting, a medium I have so much appreciation for, but also one that finds difficult to approach. I still deal with subtleties of depth and geometries, and like the gold works, the colors change and shift as the viewer moves around them. 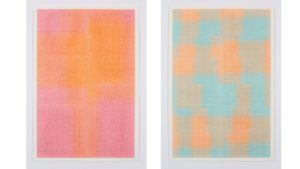 Left: Abdolreza Aminlari, “Untitled” (2016), thread on paper, 22 x 15 inches. [fivecol_three]JL: What role does photography play in your practice today? 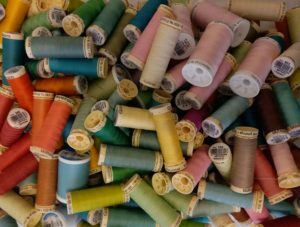 Spools of colorful sewing thread in Aminlari’s studio. JL: What are some sources of inspiration for you?